Obverse: Laureate head of Domitian right with aegis on left shoulder. Text around IMP CAESDOMIT AVG GERM COS XV CENS PER PP. Reverse: Domitian to right in military uniform standing left on a suggestus, holding sceptre across left arm and raising right arm; in front of him three soldiers in military attire, standing right. The left soldier holds a scutum (shield) in his left hand and a aquila (standard) in his right, the central soldier holds a scutum in his left hand and the right soldier an aquila in his right hand. S C across the field with FID EXERCIT in the exergue. History: Domitian was given the title of Augustus and thus became the emperor after Titus' death. He campaigned extensively in Britain and present-day Germany, ultimately being successful in both areas. 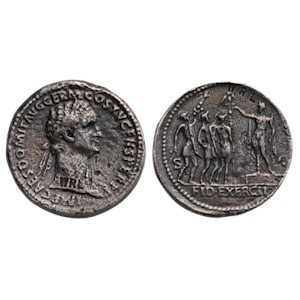 The reverse of this coin sends the message that the Emperor is in firm command with the wording FID EXERCIT translating to 'loyalty of the army'.